To understand visual images particular to guitar music theory such as tablature, chord diagrams and scale diagrams and even staff notation it’s important to get an understanding of orientation of pitch and the physical placement of the hands on our instrument. To summarise pitch direction: the bigger the string the slower it vibrates and therefore the lower the pitch. Likewise the smaller the string the faster it vibrates and therefore the higher the pitch. Music is an aural domain. That is to say it operates in a listening world of experiences. It makes good sense to trying to keep orientation focused on the sound of things rather than the look of things. To get more information on understanding of pitch directions go to the Theory Ground Floor page. There is also the consideration of right or left hand dominance. If you want to know more about left-handed guitar go to the Left Handed page. For now we will stick to the right-handed convention of guitar music theory where the right hand strums and the left hand frets. Ok so if we can in a logical way label the strings and relevant guitar parts with names that make sense we can relate these visual items to sound and pitch direction. A piece of paper that you are looking at is the guitar you are looking at. For example if your guitar is up against a wall or on a stand with strings facing you, you will see the headstock pointing upward toward the ceiling and the three bass strings to your left side and the three treble strings to your right side. 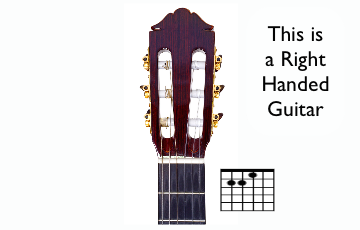 You must remember to keep the thick line on the diagram (or the diagram's appropriate border line) in the same orientation to the real guitar nut that it represents when you put, or imagen to put, the piece of paper on your lap. 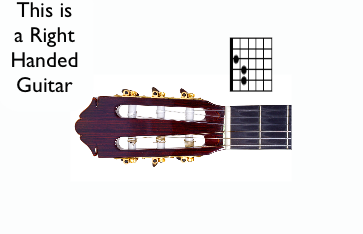 Remember when relating physical things to guitar music theory, there are many types of guitar and therefore guitar headstocks but they are all pretty much the same in function. Have a look at a couple of different style headstocks below. If your guitar headstock looks different to the ones shown here don't let that confuse you either. Just look for the common parts like the tuning keys and nut. You can also go to the types of guitar page for more info.